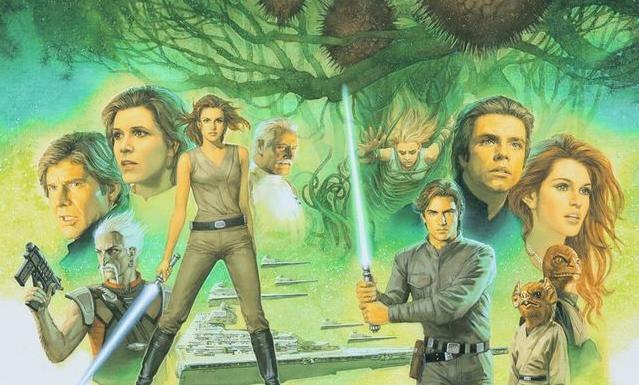 Alongside the now-confirmed Han Solo movie and the still-theoretical Boba Fett movie, one of the most perennially-rumored spinoff films is one (or three!) centering on Obi-Wan Kenobi. While such a movie could conceivably be set during the Clone Wars thanks to Ewan McGregor’s annoying eternal youthfulness, speculation generally assumes the movie would be set during his exile on Tatooine (for the record, Ewan is currently 44, which in Obi years puts him at about six years after Revenge of the Sith). Speculation also tends to assume, at least when I’ve seen it, that the story would involve some sort of dire mission pulling him away from Tatooine for a brief time. Leaving aside the conceit that anything could be important enough to pull him away from Luke, and leaving aside the fact that rather than twiddling his thumbs, the one thing we know for sure is that Obi-Wan spent that time communing with Qui-Gon and Yoda and learning how to transcend death (which was still a distant second on his list of priorities after safeguarding Luke), it bugs me when people take for granted the idea that an Obi-Wan movie would automatically require him to leave Tatooine, because for all its ostensible overuse in the film saga, Tatooine is really interesting. Like Kenobi‘s relationship with westerns, Star Wars is the best vehicle you could ask for for riffing on assorted genres, and from the early reports on Rogue One as a gritty war movie in the vein of Zero Dark Thirty, it would appear the people picking the spinoffs are aware of that, and intend to capitalize on it. The thing about genre storytelling, though—by definition, it’s traditional, and being traditional, it tends not to require an excess of SW-style planet-hopping. Hell, there are some great genre films out there that barely even take you outside of one building. In honor of the galaxy’s wealth of interesting locations, I asked the others to pitch me not any spinoff film in particular, but rather a planet that they think would best support an entire movie—or better yet, movies. Alexander: When people think of Corellia, inevitably the first thing that comes to mind will be Han Solo. That, or space otters. But despite being rather more famous for producing Corellians than for being Corellia, it’s still a perfectly viable setting for all sorts of stories one might choose to tell, even if you discount the influence of its most famous residents and the fact that it’s the primary world in a system with an unprecedented five inhabited planets and three separate species. What’s most rarely touched upon – and most important for us – is that Corellia is a corporate-ruled dictatorship with its own independent military and police forces, even under the Empire, with the “ruling” Diktat being nothing more than a puppet for such industrial behemoths as the Corellian Engineering and Mining Corporations. The government of Corellia exists solely for the purpose of accommodating – or rather, obeying – its powerful business interests, essentially making it the Star Wars galaxy’s very own cyberpunk setting. And from there, there are so many different roads a film could take that it feels wasteful to choose just one. Do you want a mystery? The Corellian Security Force is the most famous law enforcement agency after the Jedi themselves: the NYPD of a galaxy far, far away. Corellia has some of the biggest and most influential shipyards in the galaxy, and is the headquarters for numerous megacorporations: industrial espionage (and warfare) is a given. Its state of unusual independence under the Empire and the overlapping Imperial-CorSec jurisdictions offer ample opportunities for the fomentation of rebellion and the sabotage of the Imperial war machine, especially if the aid of the system’s other native species is sought. Aesthetically, Corellia has a great deal to offer us on the big screen. The capital, Coronet (top), is a colorful and diverse metropolis of millions, noted for its architecture, diversity of inhabitants, economic wealth, and active nightlife. It has skyscrapers several hundred stories high (the Burj Khalifa in Dubai, for comparison, has only 163 floors), hyperfast maglev trains, crime-ridden slums and black markets, heavily-guarded mansions, and even an underground city full of Selonians. Anything and everything one could want from an urban setting. But Corellia’s less developed landscape shouldn’t be overlooked either, being a world no less aesthetically pleasing than Naboo: it has hills, mountains, plains, seas, the Gold Beaches (and the Black Gold Beaches), lowland forests, the High Deserts (home to Sand Panthers, large predatory felines with venomous claws), and the Crystal Swamps (famous for their underground swoop racing – much better than podracing). That’s a good deal more environmental variety than you’re likely to find on almost any other planet of note in the galaxy, and if you’re willing to go a bit beyond the surface in terms of your story, the Orbital Industrial Zone might very well count as a city of its own – home to everything from a naval academy to private luxury space stations to the CEC headquarters. That it produced Han Solo is reason enough for it to be safe to assume that we’ll see Corellia on the big screen eventually, but he’s far from the only reason we should look forward to visiting it. Rocky: If ever a single planet could carry a movie, it would be Zonama Sekot. So what if it’s Legends; we’ve seen time and again elements of Legends brought back. What better than a living world, one that seems a bit out of place among exotic technology and metal starships? Instead, this world is entirely organic. Perhaps we know that it’s a seed from a faraway galaxy’s capital world, perhaps we don’t. But there are so many unexplored corners of the galaxy, and if one of them happened to contain a living planet, all for the better. Think of it. Wandering around in some backwater, poorly mapped corner of the Outer Rim, our valiant heroes come upon a planet. A planet that is so much more full of life than any other planet in the galaxy, one that seems to have life completely different from anything else that’s been seen. It can even grow entire organic starships! The planet itself is sentient- remember that Zonama is the planet while Sekot is its intelligence. A planet that can communicate and has a will of its own makes for something unusual even in a large and strange galaxy, and continues a more fantasy feel. For all that Star Wars is a story of space exploration and technology, the completely different feel of a truly living and sentient world might be just what we need. It’s a perfect setting for so many stories, for adventures and intrigue, lost ancient artifacts, a jumping-off point to explore other lost corners of the universe. Consider also the gorgeous vistas over forests and meadows- it would definitely be a picturesque setting, what with all the alien vegetation and landscapes. Zonama Sekot is, in Legends, from a completely different galaxy. Everything about it is different; even the concept of a planet that can relocate itself and travel through hyperspace is unusual. It would be easy for explorers, rebels, pirates, or someone with a broken hyperdrive to stumble across a living world out in the middle of nowhere, or perhaps get marooned on it. The contrast of such a life-filled world, especially compared to planets like Coruscant, could be a great standalone story. Best of all, Zonama Sekot opens up a great many more stories to tell. Perhaps we could even explore what a world from another galaxy is doing in ours. Ben W: Okay, here’s the pitch. We want to capture some of the grit and grime living in a place ruled by the criminal syndicates would bring down. We’ve had urban-sprawl movies set somewhere in the real world, but what about an entire planetoid of it? Let’s give Lucasfilm and whatever director they choose a chance to show the galaxy’s underbelly, to show some of the refugees and poverty that the prequel trilogy referred to but never showed. And what better place to show all of that off than Nar Shaddaa, a moon entirely overgrown with city, but not just city, polluted, filthy, crime-infested slums? Nar Shaddaa’s one of the planetoids that have been portrayed the most often of any location not already in the movies. It’s been in video games, comics, novels, pretty much every entry in the ‘verse aside from a movie. And it’s not hard to figure out why it’s such a popular setting. The towering urban spires and deep, plunging canyons are a visual delight that can’t be understated. 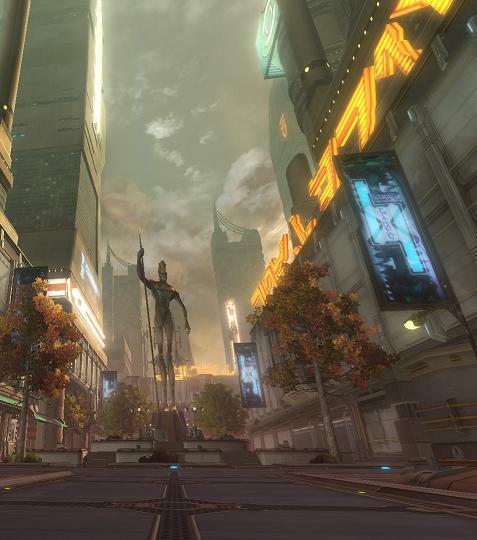 The Vertical City shown in games like Dark Forces II: Jedi Knight is a dark mirror to Coruscant, dirty and crowded where Coruscant is sleek and spacious. Buildings crumble, beings die, and nowhere is truly safe or protected. But it’s the nature of the moon as both a refugee haven and a hub for organized crime that brings the most potential from a storytelling perspective. It means that anyone can be there and anything can happen. We can have a crime-centric story about a young gangster trying to climb through the ranks of a Hutt cartel. We can have a story about Jedi on the run from the Empire after Order 66 was handed down. We can have a story about a grizzled, aged bounty hunter doing one last job before retiring. We can have a story about a young refugee desperately trying to find the members of their family after slavers carried them away. Or we can have all of those at once. Nar Shaddaa is the perfect setting for a more grounded story, of simple beings trying to make their way in a cruel, indifferent universe. And it holds the possibility for a lot of unexpected and unique character groups to come together, or go up against each other. Who or what might be lurking in the shadows? Who might the heroes be? Are they heroes, or only protagonists doing their best in a messy, messy situation? Will the planet claim victims of its own? Having a setting with these sorts of questions available only makes the potential for storytelling that much stronger. Jay: Alderaan is almost an easy answer, but one that’s impossible to pass up for obvious reasons. As far back as the initial Phantom Menace trailers, people wondered if Alderaan would play a starring role in the prequel films. The time has passed on that one, but not for an Alderaan story. The types of stories that Alderaan can support are immense, and the planet itself supports that sort of dynamism. 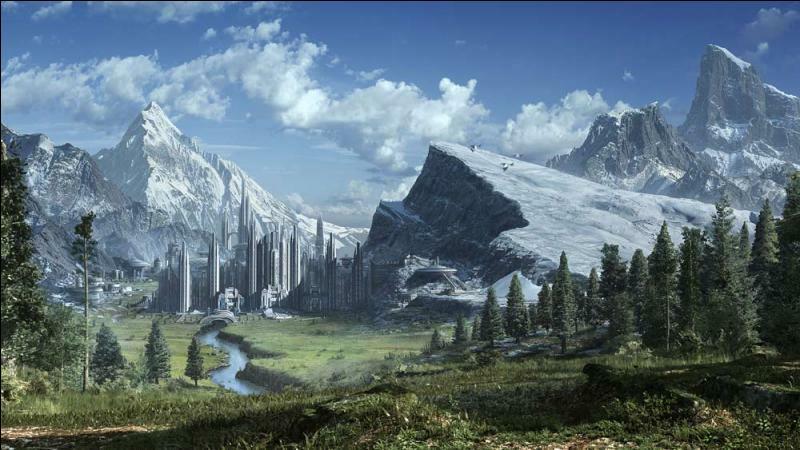 From ROTS, we saw Aldera City — an idyllic, futuristic city in a beautiful alpine setting. Aldera City looks serene, peaceful, and blends seamlessly with its environment. No blight on nature is this, but rather a city in complete harmony with its surroundings. Alderaan’s snow-capped peaks are breathtaking, and the clouds that roll over it provide an almost heavenly backdrop. Aldera itself is home to poets and philosophers, statesmen and artisans. 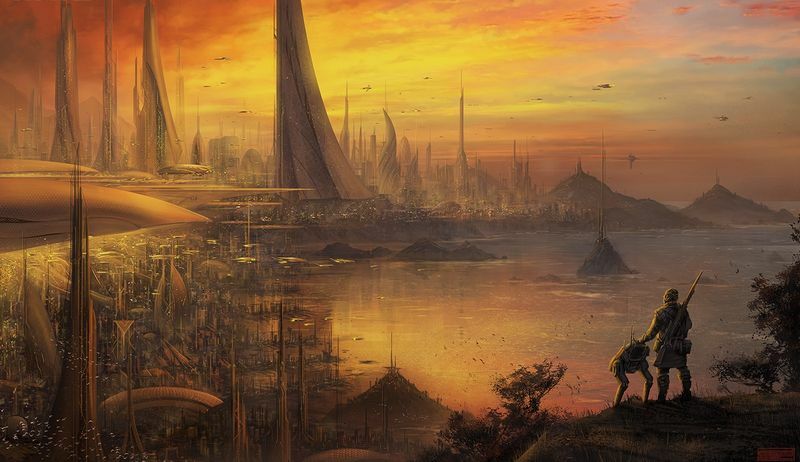 Though we only saw the peaceful palace precincts in the film, I imagine the city is thriving with sights and sounds — but not like a bustling, impatient Coruscant, a crime-ridden and mind-bending Nar Shaddaa, or even a diverse and surprising Coronet City. No, Aldera is a city that thrives with live: imagine those philosophers in their debates, the artists discussing the merits of their works, families going on various outings… it’s a living city, and a pleasant city. So much of Star Wars is either spectacular or gritty, while Alderaan is where life itself is celebrated. Humanity (in the general sense), nature, all of it together. Speaking of nature, the sounds of a thranta call (like whalesong, as imagined in The Old Republic) might cut through the din of Aldera City. A majestic creature flies overhead, and children and adults point at it in wonder. The thranta flies over and through the spires of Aldera City, crests the mountain tops, and flies through the grasses and passes of the ranges while iced vineyards, farmlands, and resorts intermingle with lakes, plains, and dales filled with animals of various sorts. Away from the eyes of the House of Organa, different sorts of folk make their living. Some are more rural, others enjoy nature, and still others intrigue and plot in their ways, for Alderaan is an idyllic planet but it is not Eden in space. See, Alderaan seems like a utopia but it’s a utopia of the real. Alderaan is no Arthurian monarchy where everyone is good and just, but it is a democracy. Its great royal houses have struggled and waged war in the past, as seen in the EU’s Alderaan Ascendancy Contention or TOR’s house wars. Alderaan is a peaceful world that renounced violence after the Clone Wars, but not everyone agrees: some wish to fight the Empire, while others just want Alderaan to have its place in the sun. There are criminals on Alderaan too — a world famous for art and wine can’t help but have a black market, and the idea of a crime story set in such a perfect world has merit. Some Alderaanians are Imperial officers, sworn to uphold Alderaan’s peace by serving the Empire but they can’t help but wonder if some of their friends and family would cause war to return to Alderaan through their misguided idealism. Here and there, we might see a firebrand revolutionary — it’s all well and good that Alderaan is one of the most cultured and prosperous Core Worlds, but it’s easy to say that from the heights of the palace — but what use is a democracy that upholds the privileged and the royal? In the Palace itself, we might see a young Princess Leia learning the ways of the court (and not doing a great job hiding her dissatisfaction at it), but enjoying apprenticing with her father in the Senate where she might do something more useful to her thirst to make a difference than learning a ballroom dance or two. A foreign suitor might come to Alderaan, expecting a familiar familial match but not realizing that Alderaan is not like other Core World monarchies and Princess Leia gets to choose her own destiny. Or perhaps that typical, overdone plotline gets turned on its head and the foreign suitor doesn’t wish to marry Leia either — and they find each other kindred spirits in spoiling a match their parents are set on, but set seeds for a future political partnership in the Senate. Perhaps the Empire sends an assassin to Alderaan, eager to end Bail Organa without fuss but it turns out the old man is more prepared to foil an assassin than it might appear? And so on and so forth. I love this planet and I love the myriad of storytelling possibilities it might present, taking advantage of and twisting expectations. Whatever happens though, I expect an audience’s throat to catch when they see the beauty of this world and realize what happens to it, just as my first landing on Alderaan in The Old Republic caused me to shake my fist and curse that monstrous Tarkin.